In early June 2018, the symposium Karst 2018 “Expect the unexpected” was organised to honour of 80th Anniversary of Petar T. Milanović’s birth. It was held in Trebinje, eastern Bosnia & Herzegovina, located on the northern rim of one of the spectacular Dinaric karst poljes – Popovo polje in the Trebišnjica River basin, 30 km from the Adriatic coastline. This area in the heart of “classical karst” was thoroughly studied by professor Milanović for many years. The symposium was organised by the Hydro Power Plant Dabar (Trebinje) and the University of Belgrade, Faculty of Mining and Geology, the Centre for Karst Hydrogeology of the Department of Hydrogeology, and in partnership with IAH’s Karst Commission and the Geological Survey of the Republic of Srpska. We’d like to thank the Municipality of Trebinje and Hydro Power System Trebišnjica for their sponsorship and support. Around 100 people from 17 countries attended the symposium – from USA, Canada, Russia, China, Turkey, Albania, Hungary, Austria, Romania, Bulgaria, FYR Macedonia, Montenegro, Croatia, Slovenia, Italia, Bosnia & Herzegovina and Serbia. On the first day, the opening ceremony took place in the Cultural Centre of Trebinje. 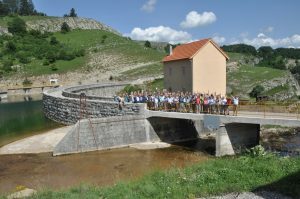 The second day was spent on a day’s excursion to the “Upper Horizons” of Trebišnjica Hydro Energy Power System. On the last day, four oral presentations and one poster session were held. Keynote speakers were Derek Ford, Richard Parizek, Ralph Benischke, Lu Yaoru, Zoran Stevanović and Neno Kukurić. The symposium Proceedings contain 56 papers written by 150 authors and are available to view.